I ended up making a version of Chicken Satay. 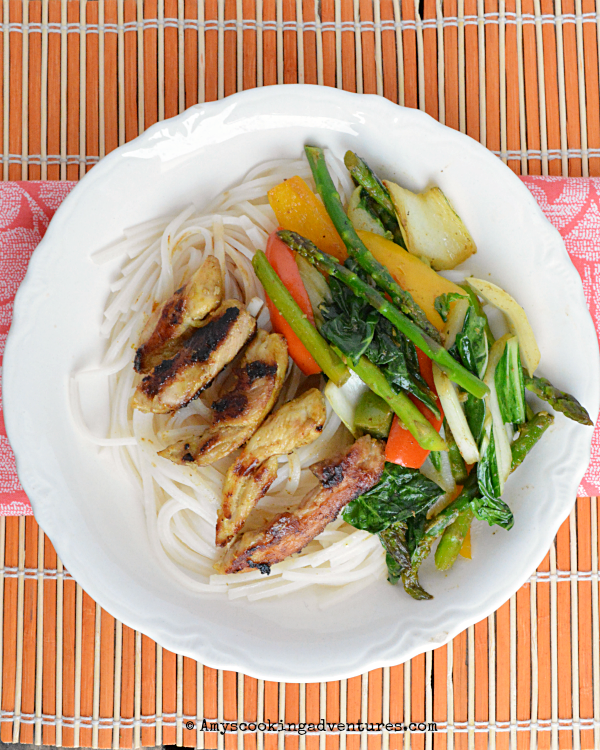 The chicken in Chicken Satay is meant to be pounded flat and grilled. But my grill is currently living in a snow bank, so I chopped by chicken into strips and pan-fried it in a skillet instead. Then, I made a stir fry of Thai-inspired vegetables and used the remaining marinade as a sauce for the veggies and it was amazing! At first Spud gave the chicken the squinty eye and asked, “why is the chicken that color?” We talked briefly about turmeric and how it’s often used as a natural coloring and then he was fine. The whole family loved the chicken (but the veggies got a little spicy for the kids). Oh and if you’ll notice, I did end up using fish sauce in this recipe. And yes I died a little inside. But no, I actually couldn’t taste it. Check out all the wonderful Thai dishes prepared by fellow Eat the World members and share with #eattheworld. Place the chicken in a gallon sized zipper bag. Whisk together the marinade ingredients and pour over the chicken. Refrigerate overnight. To cook, heat 1 tablespoon of olive oil in a large skillet. Add the chicken (reserve marinade) and cook until the chicken is done. Set chicken aside and cover with foil to keep warm. Add more oil to the same skillet. Add the veggies and cook for 1-2 minutes. Add the remaining marinade. Cook until marinade is reduced and vegetables are cooked. 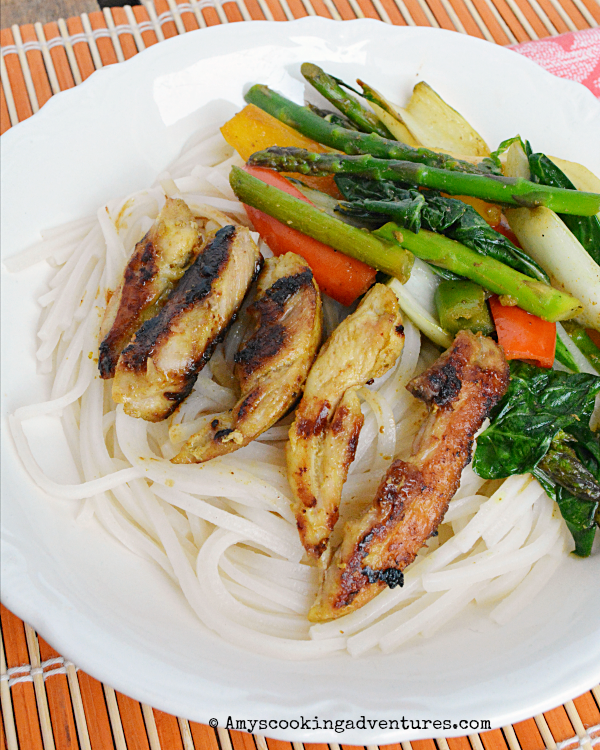 Serve chicken and vegetables over rice noodles and season with soy sauce. 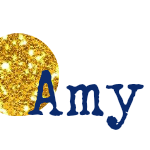 Thanks for the chuckle for today Amy. I think your dish sounds delicious. You had me cracking up here with your household aversions - no coconut, no fish sauce, and no tofu! And as far as ingredients that I've never heard of, I live for those! ;) Well, I'm glad you joined us and can't wait to see where we travel next. My boys would love this satay. Yeah no grilling for me soon either with weather lol. Well you rose to the challenge still I say the chicken satay looks so good Amy! Wow, I am impressed! You made a fantastic looking meal without using any of your food nemeses, and stayed true to all those delicious Thai flavours. The marinade sounds so flavourful with all those great ingredients. Colourful dish!